OECE’s work is grounded in the belief that all families have the right to thrive. We strongly support San Francisco’s status as a sanctuary city and wholeheartedly endorse the Mayor and Mayor-elect’s joint statement below. Joint Statement – Mayor Mark Farrell and Mayor-Elect London Breed: Mayor Mark Farrell and Mayor-Elect London Breed have called upon United States Attorney General Jeff Sessions to immediately stop separating families at the Mexican border as an anti-immigration policy. “As a father of three young children I will never support the federal administration’s decision to tear apart families and use children as pawns in a political game. The images we are seeing of children warehoused in metal cages are beyond the pale and sicken me to my core. What we are witnessing runs completely counter to our country’s values and founding principles. I am urging the federal government to immediately reconsider their immigration policy changes and provide clear, humane reunification plans. More than ever, we need Congress to move forward with comprehensive immigration reform measures for our country. “The policy of forcibly removing children from their parents at our border is horrific and unacceptable. 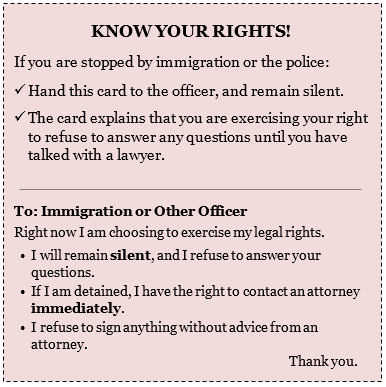 Immigrant and Refugee Children: A Guide for Educators and Support Staff to protect and prepare children and families in case of an immigration and ICE raid. Building a Bright Future for All a resource guide to help educators better serve immigrant children, promote early learning opportunities, and share resources with families. On April 25, 2018 the San Francisco Office of Early Care and Education and First 5 San Francisco hosted our 2nd semi-annual ELS/PFA All Partner Meeting! Held in beautiful Golden Gate Park, this meeting focused on the theme of Children in Nature and included a keynote address from Phil Ginsburg, Director of the San Francisco Recreation and Parks Department as well as an abundance of nature-based resources, activities, and giveaways. November 20, 2017 version of OECE’s Operating Guidelines released. This version includes updates to the family fee schedule and OECE staff contact information. Click HERE to view them in English, Spanish and Chinese. OECE’s first All Partner Meeting held on Sept 14, 2017 from 6:30-8:30 pm at SF State University’s Student Event Center. Click HERE to report your vacancies to SF3C. This data will be used to help ELS Voucher families identify ELS programs with openings. Check back for updates on events, new policies, and other important news.